On the 10th of July 2014, ASLM conducted a seminar in Angola that brought together a number of partners to discuss the status of implementation of the National Strategic Plan. This meeting aimed to establish strategies to strengthen laboratory networks in order for laboratories to achieve international accreditation. Over 60 participants attended the meeting in Luanda. Partners included, amongst others, Ministry of Health senior officials, CDC and PEPFAR technical teams, ASLM, African Field Epidemiology Network (AFENET), in-country WHO representatives, the Association of Public Health Laboratories (APHL) and the Angola Field Epidemiology and Laboratory Training Programme (FELTP). A number of presentations were made to inform the meeting participants on the implementation of the national laboratory strategic plan towards accreditation. Discussions were held on the creation of mechanisms to strengthen the national network of laboratories. The meeting also highlighted the activities to be supported by CDC and PEPFAR within the National Laboratory Strategic plan. During the meeting, it was emphasised that one of the priorities of the Ministry of Health of Angola is the improvement of laboratory services. 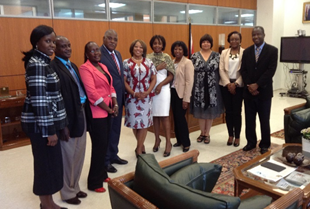 Additionally, ASLM, CDC and AFENET held a small meeting with the Minister of Health to discuss the way forward and supported needed to strengthen laboratory services in Angola.